Green Country and Southeast Clinic Surgical Arts is a comprehensive cosmetic surgery and medi-spa destination located in McAlester, Oklahoma. Dr. John Tedesco is fellowship-trained and dual board-certified in general surgery and cosmetic surgery, and carries the prestigious designation of Fellow of the American College of Osteopathic Surgeons. 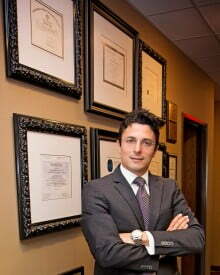 Dr. Tedesco graduated from medical school in Philadelphia, PA at the Philadelphia College of Osteopathic Medicine; completed his general surgical training in Tampa Bay, FL at Largo Medical Center; and completed his fellowship in Little Rock, AR under the esteemed direction of world-renowned plastic surgeon Dr. Jim English. Dr. Tedesco prides himself in providing absolute state-of-the-art care in the most comfortable and compassionate atmosphere possible. Dr. Tedesco has lectured nationally to other plastic and cosmetic surgeons and continually strives to stay at the cutting edge of the field. He has received numerous awards and accolades and is a member of American Mensa. We here at Green Country and Southeast Clinic Surgical Arts believe you cannot find better care or better results anywhere else in the world. American College of Osteopathic Surgeons (ACOS) member since 2000, Fellow (FACOS) since 2011. American Academy of Cosmetic Surgery (AACS) member since 2010. MENSA member since 2009. American Medical Association (AMA) member since 2000. American Osteopathic Association (AOA) member since 2000. Top 10 Cosmetic Surgeons in Oklahoma, American Institute of Plastic Surgery, 2015. Best of Muskogee, Physicians Category, Muskogee Awards Program 2014. C.T. Thompson, M.D. Excellence in Trauma Care Award 2013. Granted Fellow of the American College of Osteopathic Surgery (FACOS) 2012. Voted Employee of the Month, Sherwood Urgent Care Center 06 / 2010. Appointed to the Cambridge Directory of Who’s Who 2010. Appointed Chief Surgical Resident in fourth year of training, 2007-2008, and again senior year 2008-2009. Suncoast Hospital Resident of the Year, 2006. Radiology Competency Award, 2003. Centre County Volunteers in Medicine Service Award, 2003. Custom compression prosthetics in breast keloid treatment. Tedesco JV, Avellanet Y, Bashiri H, English J. © 2011 by The American Journal of Cosmetic Surgery, Chicago, IL. Hyperbaric Oxygen Therapy in the Treatment of Diabetic Wounds; Tedesco JV, Castillenti TA, Beale JL. To be submitted. Preparation of Skin Graft Wounds with Oxidized Cellulose; Tedesco JV, Castillenti TA. To be submitted. Extracellular wound matrix (Oasis ®) as an adjunct to negative pressure wound therapy in complicated lower extremity wounds; Tedesco JV. To be submitted. Moffit Cancer Center, Scar Revision and Fibrosis Prevention, Patient Handout, Figure 1; Klein R, Tedesco J. ©2007 by Moffit Cancer Center, Tampa, FL. Moffit Cancer Center, Scar Revision and Fibrosis Prevention, Patient Handout, Figure 2; Klein R, Tedesco J. ©2007 by Moffit Cancer Center, Tampa, FL. Moffit Cancer Center, Scar Revision and Fibrosis Prevention, Patient Handout, Figure 3; Klein R, Tedesco J. ©2007 by Moffit Cancer Center, Tampa, FL. Inflammatory Bowel Disease, The Complete Guide to Medical Management, Figure 38.1; Colonic Metabolism of Butyrate, Temmen TM, Rombeau JL, Tedesco JV. © 2006 by Flack, Inc., Thorofare, NJ. Inflammatory Bowel Disease; The Complete Guide to Medical Management, Figure 38.2; Effects of Pre-Biotics and Pro-Biotics on Colonic Microflora, Temmen TM, Rombeau JL, Tedesco, JV. © 2006 by Flack, Inc., Thorofare, NJ. Special Considerations in Post-Bariatric Body Contouring. Presented at the American Academy of Cosmetic Surgery 30th Annual Scientific Meeting, January 16, 2014 2:20PM. Section moderator Lionel Meadows, M.D.